Trump Team Promises To 'Dismantle' Dodd-Frank Bank Regulations : The Two-Way For six years, the Dodd-Frank Act has been rolling out rules intended to tame inappropriate risk-taking by banks. The Trump transition team now says the new administration will "dismantle" the law. 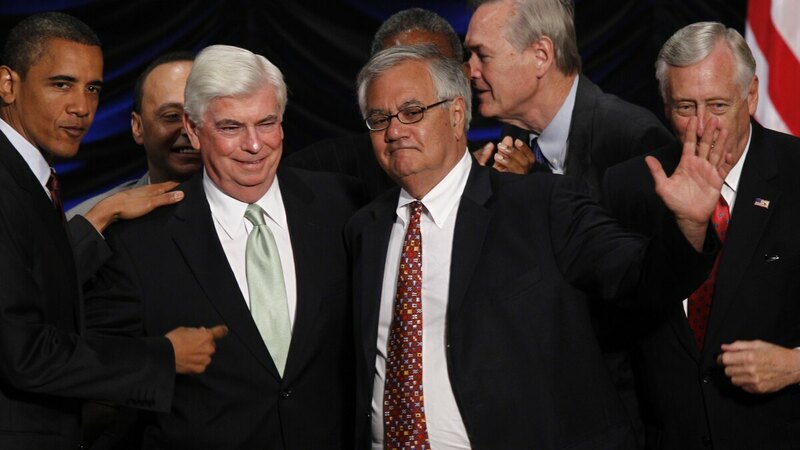 Sen. Chris Dodd and Rep. Barney Frank celebrate as their Dodd-Frank banking regulation bill is signed into law in 2010. President-elect Donald Trump has said he is interested in doing away with it. During his presidential campaign, Republican Donald Trump said he would "get rid of" Dodd-Frank — the sweeping legislation passed in 2010 to address problems underlying the 2008-2009 financial crisis. Now President-elect Trump's transition team is promising to "dismantle" the complex Dodd–Frank Wall Street Reform and Consumer Protection Act. "Bureaucratic red tape and Washington mandates are not the answer" to improving the financial system, the team said Thursday on its website. One possible target of the "dismantle" efforts might be the so-called "Volcker rule," which bars banks from making certain speculative investments that could boost profits, but not benefit their customers. The rule was first proposed by Paul Volcker, the former Federal Reserve chairman who wanted a firewall between a bank's consumer operations and its risky trading activities. Republicans might be reluctant to wipe out the agency just months after a scandal at Wells Fargo involving sham customer accounts. But the new Congress is widely expected to change the CFPB's management structure so that instead of having a single, powerful director, it would operate under a slower-moving commission. Treasury Secretary Jacob Lew, in testimony to Congress in September, defended Dodd-Frank, saying the new rules have improved safety in the financial industry. "It would be a mistake to roll back the clock on these protections," he said. In contrast, the Trump transition team said the law has flopped because "big banks got bigger while community financial institutions have disappeared at a rate of one per day, and taxpayers remain on the hook for bailing out financial firms deemed 'too big to fail.'" In an analysis of possible rollbacks of Dodd-Frank, Moody's Investors Services reached this conclusion: "While a reduction in regulatory compliance costs would bolster bank earnings, reduced oversight and a roll-back of requirements would also result in a weakening a of banks' capital and liquidity positions, a negative from a credit perspective."